The #QualityTip this week looks at Universal Design. Universal Design is the design of space that can be used by all and therefore eliminating the need for “special” requirements for people with disabilities. Have you ever wondered why that automatic door opener that you see in many businesses has a picture of a wheelchair on it? I did…and I used to tell my children when they were younger to NOT use that button as they didn’t need it! It wasn’t until I became more informed on accessibility and universal design that I realized that it’s for everyone’s use! Delivery people, those who find doors heavy, travellers with suitcases or shopping bags and yes, even parents/children who just need some easier access! 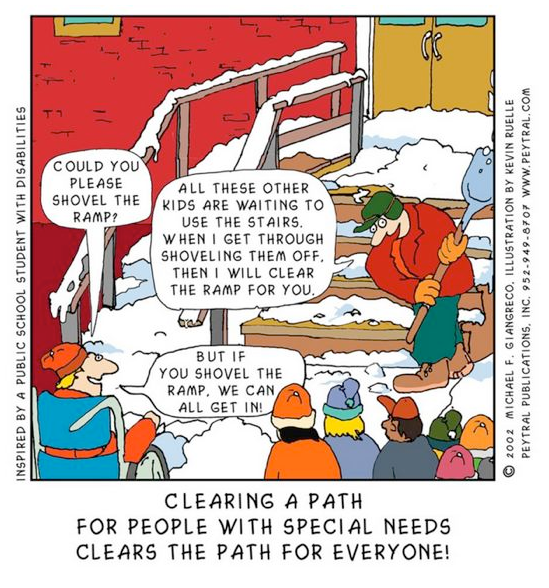 While my family may not have needed that automatic access the same way a wheelchair user or someone on crutches needs it, we can all use it the same. It is this message of inclusiveness that will help us to continue to grow and learn to respect one another as individuals. There are seven key principals of Universal Design that create a truly universal experience. You can check out Universal Design NL for all the details. There is a ton of information here relating to residential, business and public spaces, as well as benefits and resources for everyone! There is even an interactive home where you can look at the specific universal design features of each room in a house, some of which may also be applied to your tourism business. If you have any questions on how to improve your accessibility, contact us today!